Strudel, which is literally translated from German to mean ‘whirlpool’, is the quintessential Austrian dish. Created using delicate wafer-thin layers of pastry and generous fillings of fruit, meat or vegetables, it is a diverse and delicious meal. From the famous Apfel Strudel, to the lesser known pumpkin version, here are the best varieties you should try when in Austria. Apricot is a popular ingredient in Austrian cooking, and is often seen on the dessert menus in Viennese restaurants. Apricot strudel is a mouthwatering mix of juicy, sweet fruit and crunchy, buttery pastry and is perfect served warm with a generous dollop of cool vanilla ice cream on the side. The mother of all strudels, the apple variety, is the go-to version when sampling the dessert for the first time. If you are visiting Vienna and you wish to master strudel-making should consider taking an expert-led course at the bakery of Café Landtmann, or enjoy a voyeuristic experience by watching the Strudel show, taking place on the hour in the bakery of Café-Restaurant Residenz on the grounds of Schönbrunn Palace. Often made using either hazelnuts, pecans, or walnuts, and with the addition of pear to give it a moist texture, this decadent version is perfect for sweet-toothed visitors to Austria. The sour cherry strudel is a Croatian recipe. Montmorency cherries give it the essential tart taste and it is commonly served with whipped cream, just like the apple version. The strudel is not just a sweet dish, as this Greek-inspired savoury option proves, and is popular with vegetarians in Austrian restaurants. The addition of feta cheese or potato is common. Check out this recipe. 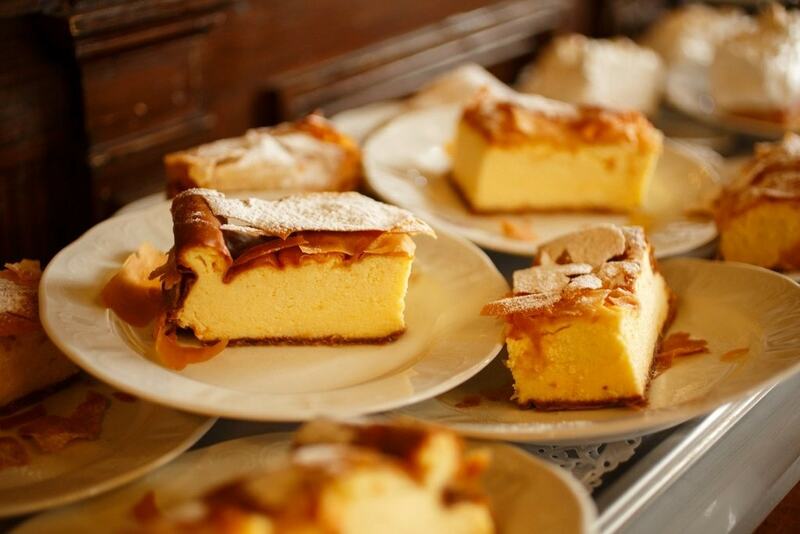 Frequently mistaken as being of German origin, this comforting confectionery has its roots in the 17th century, with the first known handwritten recipe for a milk-cream strudel dating back to 1696, kept in the halls of the Vienna Town Hall Library. The traditional Viennese milk-cream strudel is an oven-baked pastry dough stuffed with milk-soaked bread rolls, egg yolk, icing sugar, butter, quark, vanilla, lemon zest, raisins and cream, and is served drenched in piping hot vanilla sauce. The best is rumoured to be found at Café Diglas in Vienna. A particular favourite during the autumn months, this warming strudel is a cross between pumpkin pie and the traditional apple version and is neither sweet nor savoury. Most commonly made with lamb or beef, this is Austria’s answer to the English Beef Wellington. You’ll often find it on the lunch menus at Austrian wine taverns called Heuriger, and it is traditionally served with potatoes and salad.